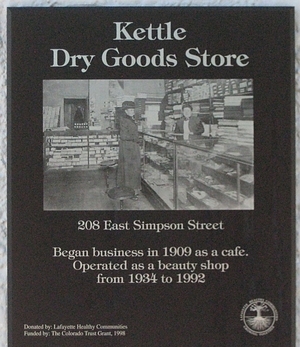 FREE Historic Plaque to Commemorate Your House's or Building's History! The Lafayette Historical Society (the Society) is pleased to announce that with the largesse of a generous anonymous donation, the Society has reintroduced a program to recognize historical homes and buildings within Lafayette with a photo plaque. How does a plaque affect what I can do to my house? Plaques put no restrictions on what you can do with your property. 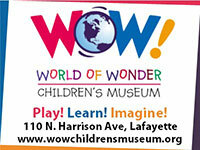 Rather, they help to celebrate Lafayette's long and fascinating history through pictures and factoids. 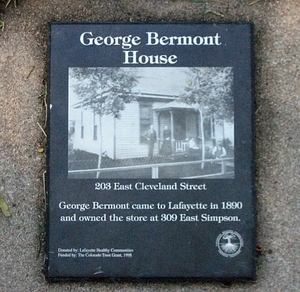 In addition, houses and buildings that currently have photo plaques (look for them on E. Cleveland and E. Simpson, for example) are shown on Lafayette's interactive walking tour of historic sites. This tour, and a paper map you can pick up at the Miners Museum (108 E. Simpson St.), helps visitors and residents find and learn more about some of the many interesting people and places in Old Town Lafayette's history. How do I apply to receive a free plaque? How is getting a plaque different from listing my property on the Lafayette Register of Historic Properties? A plaque is a way to present historical information about your property through a photo and brief description. The Lafayette Register of Historic Properties is a collection of the most architecturally, socially, and archaeologically important places in Lafayette. Established by City ordinance in 1998, its purpose is to celebrate and protect local structures, sites, and neighborhoods that represent distinctive examples of architecture, are associated with significant historic events or persons, or make a special contribution to the distinctive character of Lafayette. Property owners or other interested parties must research their properties and submit detailed applications to the Lafayette Historic Preservation Board. The Board can then recommend the application for approval by presenting it to the Lafayette City Council. The Council may then, by ordinance, designate the property or properties as a landmark or landmark district. Once a property is listed on the Register, certain proposed external architectural changes (but not paint colors) must be approved by the Historic Preservation Board prior to project initiation. Go to the City of Lafayette's website or to LOTA's "Lafayette Register of Historic Properties" webpage to learn more about how to get your house or building recognized as one of the most special places in the area!